Quality is something we all want when it comes to cars, especially older used ones. But how do we get it? I have been studying this question in one form or another for nearly 14 years now. I began my automotive career as a car dealer, buying and selling hundreds of vehicles a year. As time went on, I became an auto auctioneer, a remarketing manager and a part-owner of a wholesale auto auction. I saw thousands of cars come and go through the auction block during the course of each year, and as my worked changed, so did my understanding of quality. The overwhelming majority of the time, cars and trucks considered reliable in their early days would draw the strongest bids. But it wasn't always true; I observed some models experience costly transmission failure just as the odometer rolled past the 100,000-mile mark, while others would exhibit everything from blown head gaskets, to chronic rust issues to inoperative battery packs for hybrid vehicles. Well-respected publications such as Consumer Reports and J.D. Power & Associates do an outstanding job finding defect trends among new and slightly used vehicles. However, once that specific vehicle is sold by the survey participant, there's no access to the history of the vehicle. As the average car owner over the last decade has typically kept their vehicle for approximately five to six years, a lot of data has disappeared. Because there is no tracking service covering the problems in these vehicles, the 10-year-old vehicle that everyone assumed had great reliability will at times have terrible issues. Who knew? No one really. 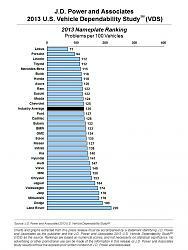 Consumer Reports' database goes back 10 years, but the average car and truck is now 11.4 years old. Trade-ins are a great measurement of that emotional question. Most consumers who trade their vehicle will get a price hundreds to thousands of dollars less than retail. Car dealers not only know the wholesale market, they know the retail market as well, and are often able to get cars repaired for a lot less than most car owners. This isn’t always the case. Clean cars can sometimes be traded-in at a retail price, and then financed to a sub-prime car buyer for even more money. Dealers who specialize in a given car brand are usually more effective in marketing and selling that specific name, and they also get a greater share of trade-ins from the brand — along with a better selection of clean vehicles. To remove this bias, I decided to gather data on trade-ins sent to wholesale auctions by large used-car retailers such as Carmax, J.D. Byrider, Drivetime, and other regional used-car retailers that don’t cater to a single automaker. This way there wouldn’t be an over-representation of a given brand. I also employed the help of Nick Lariviere, a statistician capable of creating visuals that would make all this real-world used car data easy to understand. One year and nearly 300,000 vehicles later, we have developed a new quality index that you can find here. For now, we are focusing on brands and models. 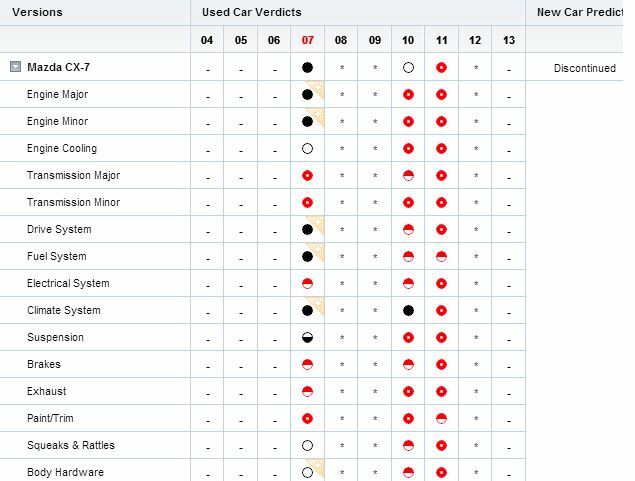 As the study continues to pool more vehicles, we’ll gradually introduce specific model year data, and even powertrain combinations, so that used car buyers can figure out where to find that older used vehicle that has truly earned its quality reputation. No list can be perfect, and it wouldn’t be right if I didn’t offer at least a couple of important caveats here. There are cars out there that are worth so little money now that they go straight to the junkyards instead of the wholesale auctions: Older Chryslers with defective 2.7-liter engines, older Suzukis and Kias, and the aquatic late '90's Ford Tauruses sometimes fall straight into the crusher once a major problem takes hold. Also, if the vehicle appeared to have reliability issues, but didn't have enough of a sample size at this point (for example: Mercury Mystique, Isuzu Axiom, Suzuki Forenza), I have kept it off the list for right now. I don't agree with #8, had one in the family and friends of the family have had them too, never any major issues. While the Mercury Mountaineer was far more identical to the Explorer, the Lincoln Aviator had a 300hp 4.6L V8 while the former two used a 239hp 4.6L version and had a unique 6 seat layout that was later offered on the Explorer when the Aviator was dropped. As to the CX-7. It was the car I almost got to replace my Explorer (handed that down to my sister), but ended up with my IS instead. Deal was on a 2008 CX-7 AWD Navi, GT full spec $32K OTD. It was the last day of the month in October so Halloween, I was at home on the phone with the dealer giving my info. When 9pm hit the salesperson interrupted me and said his system shut off and they would have to do the deal later. I took it as a sign I wasn't supposed to get the car. Because of it I ended up with my IS and here on CL . So looks like I dodged a bullet there with all the reliability issues. As it stands I still like the design. My aunt had a Mazda 626 and I remember reverse gear bit the dust. If you didn't park on an incline, you best believe you're backing that thing up Flintstones style. 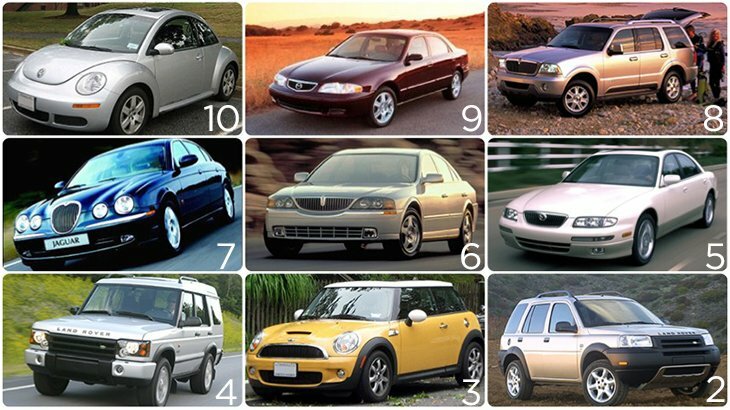 I'd be interested to see if any of these are CR best bets in used cars. 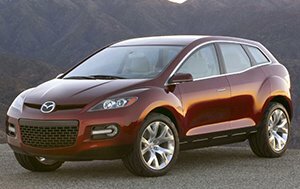 well, when i was looking to buy new used car, i noticed that ALL of CX-7's depreciated like crazy... something like to 30% of the value for 3 year old cars, which was unbelievable... there had to catch somewhere. There is a reason Lincoln is competing against Volvo in luxury car sales numbers in the United States. 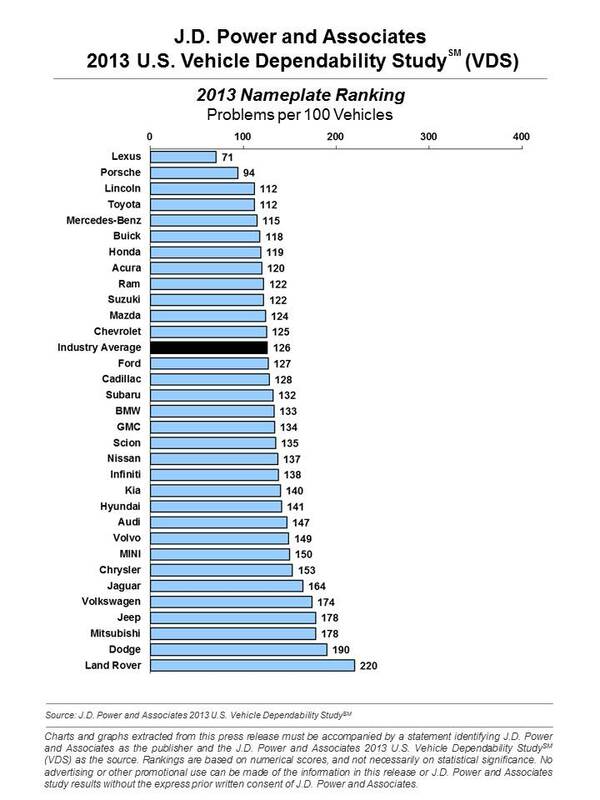 If Lincoln had even a 10th of Lexus's reliability... they might actually compete against Infiniti. Horrible Brand. Even BMW is more reliable.........that's saying something. I see two, actually. There's the blatantly obvious one you intended to point out, and also a more subtle one. With the exception of the Avalon and LS, all of these vehicles are body-on-frame trucks. These less-complicated designs are a more mature architecture that, while less efficient in terms of space and weight considerations, are generally more robust and easier to maintain. 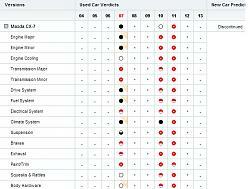 They also don't have as many interdependencies between components and are less likely to suffer major lingering damage in minor to moderate collisions. now that's a new line of apologist BS that i've never heard before. He's absolutely right...they are all BOF trucks. Lincoln's problem is not reliability, its product. They just don't have any relevant products to sell. The only one is the MKZ and MKX, and they sell pretty well...for all intents and purposes they have no other models worth mentioning. I'm sorry, you're right, all 10 are mainstream unibody cars, and the E250 and Excursion only made the list because Toyota manufactures them in Japan under contract with Ford. All products of all types are **** unless they are made under the guidance of Akio Toyoda. Further, I am categorically unqualified to comment on anything (and perhaps just a bit insane) because nearly half of the vehicles my family has owned over the past 30 years were not made by Toyota. I'll bow out now and head back to my so-called "real world". You'll recognize this as the sad, sorry place where people have non-uniform opinions and make their own observations about various phenomena, without the comforting support structure of single-vendor myopia. Last edited by geko29; 01-19-14 at 11:49 AM.